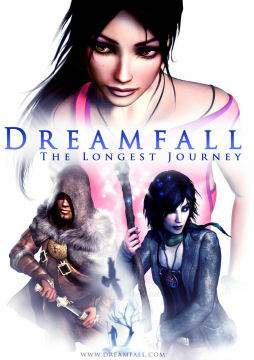 Recently I finished a number of games, of the types that are supposed to be bundled with a story in it: Fallout 3, Dragon Age, Mass Effect 2 and yesterday I finished Dreamfall. Dreamfall as a game is probably not perfect, if only because it was originally a Xbox1 game, so some of the textures are a bit wonky, the controls on PC could have been better (damn you camera! ), there's a bit too many fed-ex missions, and the fight sequences could have been more interesting... but as an engaging story, it's ace: You could watch it as a movie. In Dreamfall you switch between various protagonist, see the story from various angle, you travel between different universes, encounter strange creatures. It's the second chapter of The Longest Journey series, and it really brilliantly continue the adventure started 10 years earlier. No concession is done for the sake of gameplay or mode, you are here for a story, for an adventure, for entertaining and witty dialogues, and you get the full service. And the end is terrible because you want more. Damn you Funcom2, give me the third one now! I want to know what happens next! In comparison the three other games are really disappointing. I already wrote what I was thinking of Dragon Age, but really Mass Effect 2 is no different from Dragon Age. Mass Effect 2 is Dragon Age in space. So here we are. Bioware stopped writing story lines, instead they decided to write the same way the TV series are written: You have a vague red line of a story (mostly a background pretext for the rest), but the actual focus is in what happen in each episode: The party members interactions, and the local mission they are engaged into. There's no sense of urgency for the main story, the evil minions are not going to do anything until a particular trigger has been reached, and until then you can just visit the whole universe, do every single side quest, have romance with every single character, unlock every single achievement, perform every single loyalty quest, in the order you want, it does not matter. So yes in practice the story line has been killed in exchange for more localized missions. We are fortunate that Bioware has experience in the domain, so the missions themselves are interesting, but really I'm missing a non-pointless background. I was so disappointed by the ending of Mass Effect 2. I really did enjoy Mass Effect 1, the ending was epic, with a good progression, some nice cliffhanger, some discoveries and revelations... In comparison Mass Effect 2 is really cheesy, I did not really believe I reached the end so soon after I was able to visit the relay, I hope they are going to do something better for Mass Effect 3. Could Dragon Age and Mass Effect 2 be successfully converted to the big screen? If you cast well known and charismatic actors to compensate for the abysmal lack of depth, sure. Else better forget.